Do You Tie Dress Shoes? Your shoe laces serve more than the very important function of keeping your shoes securely fastened. They can also really complete your overall outfit look so what style and color you go for, and also how you opt to fasten them shouldn’t be over-looked or considered as an after-thought. It is, in fact, every bit as important as the shoe itself, especially when it comes to the elegant and stylish matter of dress shoes. If you’ve invested in an expensive pair of dress shoes, like for example a pair of lace up Oxfords, chances are you won’t have more than two pairs in your wardrobe. The good news then is that by changing the color and styling of your tie-up laces, you can almost create the effect of wearing an entirely new shoe. How easy and inexpensive is that? The great thing about shoe laces is that they are just as easy to take out as they are to put in so learn a few new techniques with how to fasten them. Shoe laces have been around since time immemorial. Man has always shown his inventive and creative flair and as early as 3000 BC it’s likely that some rudimentary form of a shoelace has been in existence. Traditional shoelaces have developed over time and have historically been made from all manner of natural fibers, from hemp and cotton to various forms of leather. If you could manufacture rope from it, usually it followed that there was also a shoelace made of the same material. Even when we were little boys, we had to wear formal clothes to formal events. This also meant dressing up in formal dress shoes. It was usually our dad’s job to tie the laces and I doubt there is a kid out there who really paid attention to this process. But as we get older and become adults there no excuses for not knowing how to tie the dress shoes we wear correctly. Unless all you ever wear are sneakers, of course. To answer the basic question, dress shoes DO need to be tied, and there is really no excuse for wearing untied dress shoes for any occasion. Before we get started on the ins and outs of tying your dress shoes, you may be interested to know a little bit about where this idea of tying shoes came from. As far back as about 3,500 B.C, people have been using different materials such as hemp, rawhide and other similar kinds of materials to tie shoes. There were many situations even back then in which laces were needed to help keep different kinds of shoes on the feet of their owners. The kind of shoelaces used was different depending on the kind of shoe they were being used with. Not all shoelaces work well on all kinds of shoes. It could also often depend on the area the people lived in. Naturally, not all styles of shoe will work in all environments. Just like today, using the wrong type of shoelace on a certain style of shoe would have been considered rather silly. Today, there is an even wider variety of shoe styles and laces out there. Because of that, it’s important to not only know what types of laces go with each shoe but also how to tie those laces. Naturally, you don’t want to go about tying a pair of Oxfords in the same way that you’d tie a pair of Vans skater-style shoes. That would be a way to get some interesting looks for sure! Luckily, when you go in to purchase a new pair of dress shoes, there will be plenty of examples to look at for an idea of what you need to do. Otherwise, there’s no shame in asking a professional if you’re new to dress shoes. One thing that will be important to keep in mind is that having sloppily-tied dress shoes is going to be even more of a faux pas than it would be with something like sneakers. When it comes to the sophisticated and elegant nature of the dress shoe market, shoe laces really do matter. The last thing that you want to do is ruin the overall aesthetics of your shoes with a pair of inadequate, cheap and downright nasty laces! You need your laces to ideally be 31.5 inches long, made of a waxed cotton and preferably, especially for an Oxford style dress shoe, round and thin as these are easier to thread and more resilient so they shouldn’t break. The most formal dress shoes, the Oxfords, are characterized by a closed-lace system, meaning that the laces close up the shoe and keep it securely and comfortably around your foot. The usual way for lacing the Oxford shoe is the simple bar lace or straight-laced way. This is actually the traditional, formal style and the only recommended way for tying the formal Oxford dress shoe. The tying of the formal Oxford dress shoe also needs to be elegant and tidy. Depending on the shoelace, the top knot will look like a bow and add to the elegance of the shoe. Another type of dress shoe that requires lacing and tying is the Derby shoe. Derbies are considered less dressy than Oxfords but are still business formal attire and are appropriate to wear in more laid-back combinations. The lacing of the Derby shoe is usually done in a crisscross style. This is considered to be a less formal and more laid-back style. The crisscross style of lacing is the most secure type of lacing and has the most “holding” power. This is common with the Derby shoe. The design of the Derby shoe is an opened lace system and the crisscross lacing style fits perfectly with the design of the shoe. There is, of course, nothing wrong with the bar lace (straight lacing) system for lacing and tying the Derby dress shoe. Laces are supplied every time you get a new pair of dress shoes but you should not limit yourself to just one pair of laces. You can certainly add a little “wow” effect to your old shoes by simply using new laces, even in a different color. The best quality laces that should be used with the most formal dress shoes like the patent leather Oxfords should be made from waxed round cotton string. They should be thin enough to fit through the small eyelets of the formal Oxford shoes, but strong enough not to break or disintegrate when securely tied to the shoe. Another style of laces which is appropriate for lacing dress shoes is waxed flat cotton laces. These are more common for less formal events and are used with shoes like the Derbies, wingtips or another style of less formal brogues. The flat lace also needs to be thin enough to snugly fit through the eyelets of the Derbies and strong enough to withstand secure tying. The athletic nylon lace is NEVER appropriate to be used for lacing and tying dress shoes as this is only appropriate for tying sneakers or running shoes. The easiest and least expensive way to refresh a dress shoe is to change the laces. But what color should you select? And at what length? To select the length is easy, just copy the length of the existing laces. You should know that selecting the appropriate length is essential as laces that are too short will not secure your shoe on your foot, and laces that are too long will interfere with walking and look inappropriate. When it comes to selecting the color of the laces, you can select the same as the old ones, but this can be a little boring. To refresh the look of the shoes, select a color of laces that are closely matched in black or brown that will complement the shoe. Or go wild and select a completely different color shoelace, for example wearing black shoes with dark purple or grey laces, or brown shoes with dark green shoelaces. Today you can find shoelaces in all colors, so you can go crazy and get a few different colored laces and wear them on different occasions. We have to note here that for lacing the most formal patent leather Oxford dress shoes, you should use silk or polished waxed cotton round laces that are tied into a little bow on top of the shoes. This will give you a truly elegant look will match a formal tuxedo. When wearing a work suit, you can use laces in plain cotton that match the color of the shoe. For more laid-back occasions, the dress shoes can be laced with some more “fun” shoelaces. As an alternative for a dress shoe, a flat thin lace is also appropriate. These will create a bolder and more individual aesthetic and bring some extra personality and character to your traditional styled dress shoes. Not many people realize that there is a multitude of choices when it comes to tying dress shoes. 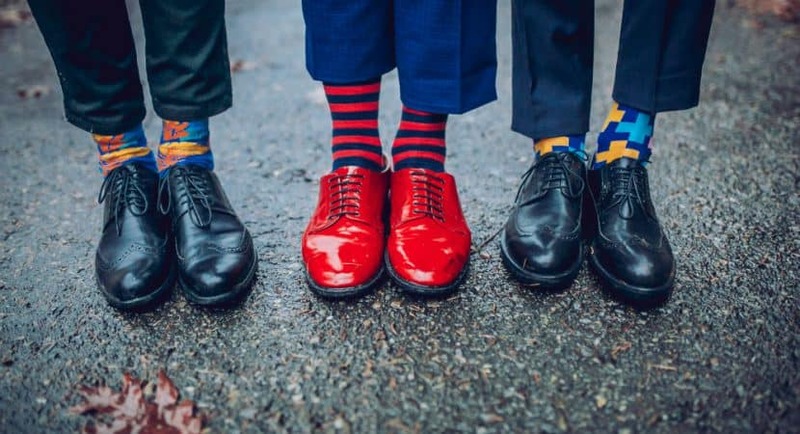 There are lots of different ways to tie dress shoes, and the correct way depends on the style of the shoe and the occasion you are preparing to attend. We have mentioned straight-bar lacing and the crisscross as the most common styles of lacing dress shoes. These are among the most common options and tend to be the easiest to complete. However, there are a few more options out there as well that might spice up your look a little! This style of lacing is rather simple, but results in an interesting look on your shoes. It creates a series of X’s down the length of your shoes. There might just be a couple of X’s or a longer line depending on the shoes you wear. At the top, you’ll just tie them in a tight bow as you would normally. Make sure it’s tight and won’t easily come undone! In this style, you get a single line at the top going across the shoe opening, followed by the laces simply moving down vertically into the next holes, followed by another horizontal crossing. It sounds much more difficult than it looks, so make sure to take a look at some examples to get an idea of how to tie this one correctly! Aside from these, there are many more options out there that you can try out to see if it suits your unique style! You may want to try out a few of them before selecting a method that fits you best. Above we have answered the basic question: YES, dress shoes need to be tied. While the top knot or two-loop is the standard shoelace knot, the really important aspect that adds to the elegant or laid-back look of the dress shoes is the lacing style. Straight lacing and crisscross lacing are the most common types, but for a less formal look, you can select any other way to lace up your dress shoes. Don’t forget that a good quality lace will also come in a variety of different color options too, so that can also be a nice way to inject a bit of your personality and own unique style into your own look. That way you can still enjoy wearing your more formal dress shoes while making them look more contemporary and casual, swapping out the usual formal laces for something with a splash of complimentary color, perhaps to co-ordinate with a tie or shirt you are wearing.